Afterglow 2015 is a series analyzing the results of the 2015 municipal elections in the Pioneer Valley and beyond. SPRINGFIELD—For one of the last times as a city councilor, Zaida Luna rose and implored her colleagues to support a resolve urging Congress to allow Puerto Rican municipalities to seek bankruptcy protection. Reflecting the concerns of many Puerto Rico-born residents like herself, Luna had hoped to add the Council’s voice to growing calls to aid the island’s finances. It was not to be. Councilors wanted more information, specifically about the underlying bill the resolve supported. The issue went to committee putting off action until January, well after the new Council is sworn. Having lost reelection last month, Luna will not be among them. Since joining the Council as the first councilor Ward 1 elected since the Eisenhower administration (and the Council’s first Latina), Luna’s focus was more on constituent services than policy like her resolve. She eschewed indulgent speeches, perks and extraneous politicking. “That was not the goal. It was to help the people in the city,” Luna told WMassP&I Monday night. Today Ward 1 is heavily Hispanic, but the city’s Latino community is also Balkanized. Establishment Latinos, centered around the New North Citizens Council, have historically been politically well-connected. That Luna has beat three opponents from this bloc is a testament to her own style of politics. A firm opposition to the cloistered nature of city politics cost Luna some potential allies while gaining her support among those who felt city jobs, contracts and policy only benefited the well-connected. Unfortunately for Luna, Adam Gomez overcame that advantage. Personifying the demographic especially harmed by decades of municipal neglect—young, mostly male Latinos—Gomez spoke to Ward 1’s direst needs. He could also appeal to better-heeled pockets like Classical Condominiums and Mattoon Street. Luna’s loss also represents an unfortunate political backslide here. With her defeat, at-large councilor Kateri Walsh becomes the Council’s sole female member. Three School Committee members are women, but none of the legislative delegation is. Luna is also only the second woman of color elected to the Council. “It is certainly a change in the dynamic,” Walsh said before Monday’s Council meeting, suggesting women legislators are sometimes better equipped to find compromise. “Any body that does not have diversity suffers,” she added. Walsh echoed others’ observations Luna was a rabid advocate for her community. However, as the Puerto Rico resolve demonstrated, what personal connection Luna had with colleagues did not always extend itself to policy and politics. Council sources noted that the resolve was on the agenda for weeks and Luna could have addressed questions before Monday. Had she shepherded it through the body better, it might have passed. Though her loss was similar to Ward 5 Councilor Clodo Concepcion’s loss to Marcus Williams the parallels are inexact. Concepcion utterly refused to meaningfully campaign and established no political beachheads outside his 16 Acres base. Ward 5’s lopsided result underscores how Concepcion lost his race as much, if not more so than Williams won it. Luna’s closer loss was more complicated. Luna’s coalition spanned everyday constituents and labor. She had firm ties with SEIU Community Action. Service Employees International Union, Local 1199 endorsed her reelection this year. Those ties were fraying before this year, though. During the 2014 primary for the 10th Hampden District, Luna irked labor leaders who thought she had promised to remain neutral. She had ties to both Ivette Hernandez, labor’s preferred choice, and her colleague Melvin Edwards, but told WMassP&I then she was backing the latter. Carlos Gonzales ultimately won the primary. Hernandez, an avid labor, Latino and women’s rights activist, was defeated but emerged with a tremendous boost in visibility and political capital. Any tension between the two women was not immediately apparent. Both campaigned for Martha Coakley last year and seemed close entering this year. 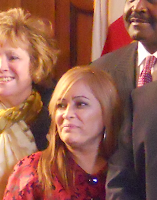 But Hernandez stayed on the sidelines after Gomez got into the Ward 1 race. Then, alongside Neighbor 2 Neighbor, a community organization with deep ties to progressive groups including labor, Hernandez backed Gomez. Lacking powerful advocates like Hernandez and troops to knock doors, Luna’s frenetic campaigning could not alone secure her another term. Speaking to WMassP&I, Luna was philosophical. Holding onto her desk’s contents and the nameplate retiring members keep as a memento, she said she didn’t know what her future role she would have, but was making time for family and friends. While she did not know if she would seek elected office again, Luna still expected to be helping people.